A Chemical Skin Peel helps to create a younger, fresher look by improving the texture of your skin. They can help to reduce the signs of ageing, treat scars and blemishes and create healthier, firmer looking skin without the need for surgery. A Chemical Skin Peel from the Claudia McGloin Clinic could help if you have any of the following: Fine Lines or Wrinkles, Acne or Acne Scars, Sunspots or Freckles, Uneven or Greasy Skin. The aim of the Chemical Peel is to rejuvenate the face giving you Smoother, Softer, Blemish Free Skin. The Chemical Skin Peels used in the Claudia McGloin Clinic are Medical Peels and can only be carried out by highly qualified, trained Doctors and Nurses. They are not available on the high street and should not be confused with very mild and gentle glycolic peels available from beauty therapists. A glycolic acid peel is a mild, natural alphahydroxy acid (AHA) skin peel that derives from sugar cane and sometimes fruit acids. 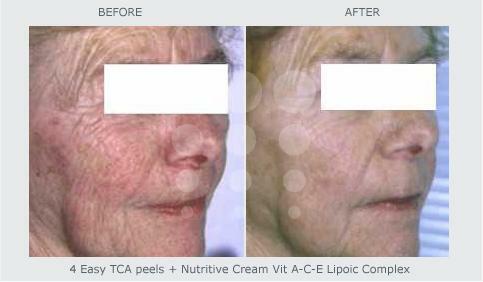 Trichloroacetic Acid (TCA) and Phenol Chemical Peels are much stronger and offer more dramatic results. Chemical Peels remove the top layer or layers of skin using a chemical preparation. As the new skin grows back, it is normally smoother than before and imperfections are reduced. There are various types of Chemical Peel – Superficial, Medium and Deep. They achieve different results depending on your needs and recovery times vary. Superficial Chemical Peels are easy to apply and the time needed for healing is minimal, but they won’t achieve long lasting or dramatic results. Superficial Peels aim to smooth and brighten the skin. They are suitable for those who don’t have time to recover from a Deeper Peel or don’t want any visible peeling. 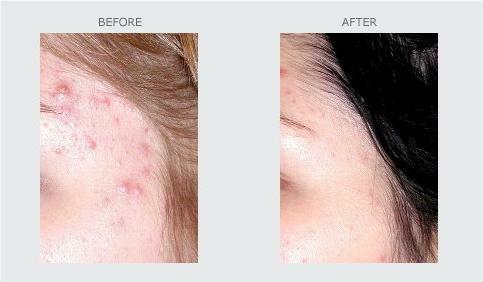 Medium Chemical Peels can achieve more noticeable and long lasting results for surface blemishes, fine lines and facial scarring, such as acne scarring. A Deep Peel will help reduce more severe facial wrinkles, and is often used around the mouth and eyes. Chemical Peels take between 15 minutes and 20 minutes, and you will be able to return home or to work straight away. Depending on the type of peel you have, your will begin to peel two to three days after the procedure and the new smoother skin will emerge. As with any Cosmetic Procedure, it is important that you review your expectations thoroughly before you decide to proceed. Your Practitioner will explain the results you can expect from each type of peel and will discuss the associated risks and alternatives before going ahead. The purpose of a Chemical Peel is to remedy Skin Aging, Pigmentation Marks, Acne Scars, Seborrhoea, etc. The skins texture is refined and the complexion becomes clearer and brighter. There are 3 different types of peels – Light, Medium and Deep. All Chemical Peels should be carried out in a surgery by an experienced Nurse or Doctor. A Medical Peel is not just an exfoliation treatment that can be done at home. To optimize peeling results whilst keeping secondary effects to a minimum, Skin Tech has prepared perfectly complementary daily care skin products. Depending on the condition of your skin and the results you are looking for, your Practitioner will help you choose the peel and daily care products you need. Only Medical Professionals are qualified to do this. 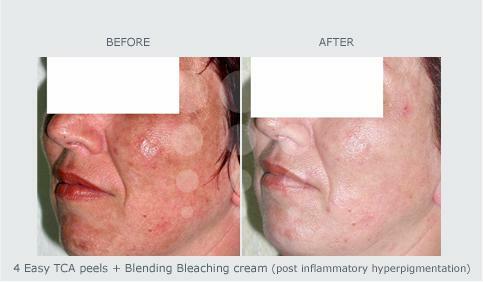 Chemical Skin Peels can be used on the Face, Neck, Decolletage and Hands. Easy Phytic is a solution (enabling strong Dermal Stimulation) composed of a blend of pure acids with controlled gradual release: glycolic, lactic and mandelic acids are not neutralised despite pH below 1. Phytic Acid is a strong anti-oxidant. The increased effectiveness of the acids does not mean that social activities need to be postponed. This is a slow release, Superficial Peel designed for those of you who don’t want or can’t afford to have visible flaking. Easy Phytic evens out the complexion and has a marked tightening effect. It helps to erase acne marks. While the peel is being applied, you will feel a tightening sensation. At the end of the treatment, your Practitioner will massage the treated area until the tingling stops. The tingling may come and go for up to 1 hour after the peel. Over the next few days after the peel, your skin will flake ever so slightly, if at all. * On the evening after your treatment, you must not wash your skin. Keep the product on until the following morning. * The next morning, you can clean your skin as normal. * In the morning and the evening apply the Skin Tech care creams that your Practitioner has recommended. You are advised to use the Actilift cream to prolong the tightening effect of this peel. Particularly recommended for acne and the prevention and treatment of photoaging. 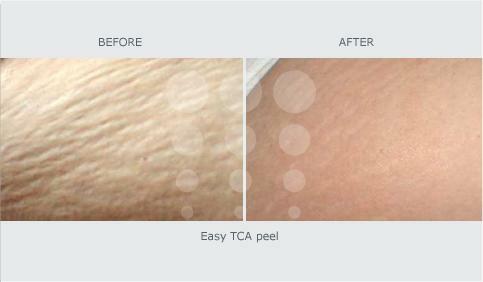 Easy TCA is considered to be the safest, most effective and easiest peeling with TCS. No pre-peel preparation is required. There is no need for social activities to be postponed. This is a highly effective medium peel that is well tolerated by the skin. It is applied in 4 weekly sessions. There is no downtime and you can carry on with your activities as normal. * Do not wash the treated area on the evening of the peel. The post peel cream applied by your practitioner must be kept on until the next day. * The next day, you can cleanse your face. * Apply the Skin Tech daily care cream recommended for your skin type. The more you moisturise your skin, the more readily it flakes. Your skin will feel better and the results will be better too. * You must always protect your skin from the sun with Metablock-HSP 50. Skin Regeneration, Photo-Aging, Acne, Hyper Pigmentations, Melasma, Chloasma, Keratoses, Fine Lines. There are special protocols for Décolleté, Hands, Forearms and Stretch Marks. Claudia McGloin Clinic do not use UNIPDEEP Skin Peels. 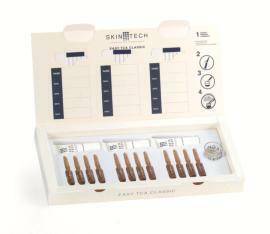 We also offer a range of Skin Tech Skin Care products for purchase. Healthier, younger looking skin for a lifetime. The Obagi Blue Peel is an in-office procedure designed to significantly improve the appearance and health of your skin. 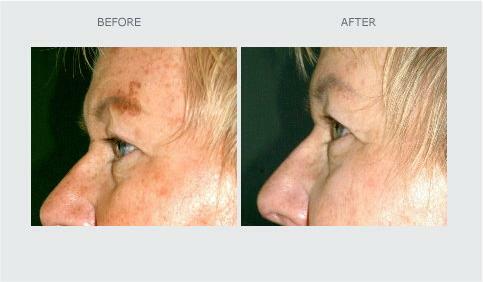 Using a low concentration of the chemical trichloroacetic acid (TCA) mixed with a special blue base to slow penetration, the Obagi Blue Peel allows your medically trained practitioner to monitor the appropriate depth to effectively remove the thin surface layers of aged and damaged skin from the face or other parts of the body. These dead skin cells are replaced by healthier ones, allowing the skins own clarity and tightness to resurface. The procedure is performed by your medical practitioner, who has specialised training and experience with this highly effective peel. What is unique about the Obagi Blue Peel? Unlike alpha-hydroxy peels or other superficial procedures, the Obagi Blue Peel allows your practitioner to control the depth of the peel and the number of coats applied in order to tailor the process to your skins specific needs, The Obagi Blue Peel can even be performed on the neck, chest, hands, back, arms and legs. The Obagi Blue Peel is a quick, relatively simple and highly tolerable procedure that in most cases does not require sedation. Application of the Obagi Blue Peel takes about 20 minutes, depending on the number of coats that your practitioner has determined are necessary to achieve your goals. You will experience a burning sensation that lasts 2-3 minutes. Immediately after the procedure, a bluish tint remains on your skin, which will usually wash off in 12 to 24 hours. After the procedure, you will experience light swelling and your skin will begin to peel within 2-3 days. This peeling will continue over the next several days and should be healed in an average to 7-10 days. If you are having a lighter, exfoliative Obagi Blue Peel. Healing is completed in 3-6 days. Before the chemical peel is applied, the skin of the face is cleaned thoroughly with a cleaning agent to remove makeup, creams and oils on your skin. Your hair is protected by a band and your eyes never come into contact with the chemical peel. Your practitioner will then apply the chemical peel to your face. Following the treatment you will be given advice regarding the after care and your practitioner will discuss further treatments with you. When you receive a chemical skin peel at Claudia McGloin Clinic, it will be performed by an experienced practitioner in the safe and comfortable surroundings of a private clinic. You can be assured of our commitment to the highest standard of healthcare and cleanliness. 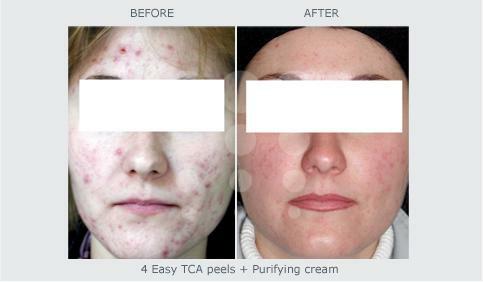 A full face TCA peel should take around 15-20 minutes. The solution may sting when applied but this will subside. Claudia McGloin Clinic uses Chemical Peels which can only be applied by specially trained doctors or nurses. How much does a chemical skin peel cost? If you would like to book a consultation for a chemical skin peel simply call or drop into the Claudia McGloin Clinic for details. The price for the chemical peel treatment starts at €80 for an Easy Phytic and €120 for an Easy TCA and will depend on the area and courses required.